"唐揚げ（Karaage）" has been as loved as Sushi and Tempura by Japanese for a long time as a popular home cooking. And now, we are experiencing a Karaage boom like never before in Japan. Karaage is not only chicken but also meat or fish, etc. But since chicken is the most popular, if you say just Karaage, it usually means chicken karaage. 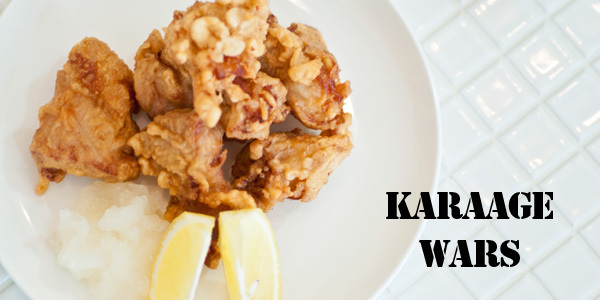 "唐（Kara）" is the ancient Chinese dynasty's name, the origin of Karaage is literally from Chinese cuisine. However, now Karaage is much more popular as one of the Japanese national foods. A few year's ago you couldn't see any store specializing in Karaage in Tokyo, but many Karaage stores have opened over past few years and are gaining popularity. Hot competitions are often featured on the TV programs and in magazines. Convenience stores like Seven Eleven, Family Mart, Lawson, Circle K Thanks are also competing in the so-called Karaage war intensely. It is said that the economic stagnation of the past two decades in Japan helped acquire its popularity. Compared with Sushi or Shrimp Tempura, Chicken is much more wallet-friendly. When I was childhood, I always asked my mother Karaage for dinner on my birthday. Having as much Karaage as I wanted was a luxurious feast for me. It hasn't changed even now, I still love Karaage!! You may know that in Izakayas (Japanese style bar & restaurant) Japanese people usually order "とりあえず生（なま） Let's start with a beer" first. In the same way, ordering Karaage in an Izakaya is standard for most of the Japanese. When you come to Japan, have not only sushi or tempura; please try some Karaage which Japanese can't help loving.